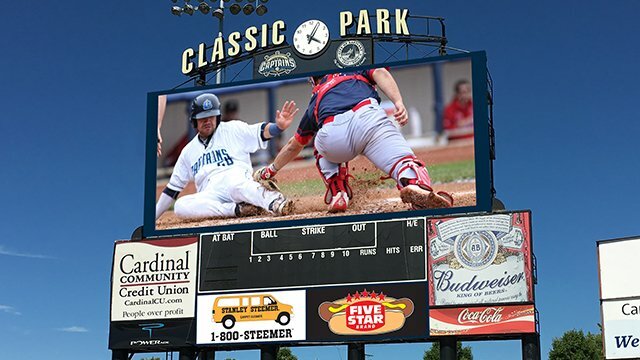 Classic Park will get a new LED video board nearly triple the size of the old one in time for the start of the 2017 season, the Lake County Captains announced Thursday at their annual Hot Stove Dinner. The new high-definition video board will be 22 feet tall by 50.5 feet wide, featuring 1,111 square feet of video screen. The old one was 17 feet tall and 23.5 feet wide, providing about 400 square feet of screen space. The 2017 season will be the Captains’ 15th in Eastlake, Ohio. The team was part of the South Atlantic League from 2003 to 2009, and has been a member of the Midwest League since 2010. This entry was posted in Lake County Captains, Midwest League, South Atlantic League. Bookmark the permalink.